When you think of Halloween, what comes to mind…? Is it trick-or-treating for candy with your kids? Is it throwing costume parties for your friends? Is it telling ghost stories around the campfire? Is it carving pumpkins? Is it all of the above? These Halloween recipes are sure to delight! Halloween is a time for superstition, entertainment, and fun! It is such a popular holiday for families around the United States, which makes it an ideal time to celebrate; and what better way to do this than to host a party for your closest friends. Before you go out trick-or-treating with your kiddos, invite your friends over for a costume party of your own to celebrate this spooky time of year. Keep in mind not all parties have to serve unhealthy foods in order for your guests to be impressed. These healthy Halloween food and drink ideas are great way to “treat” the company you will be having over at your house. 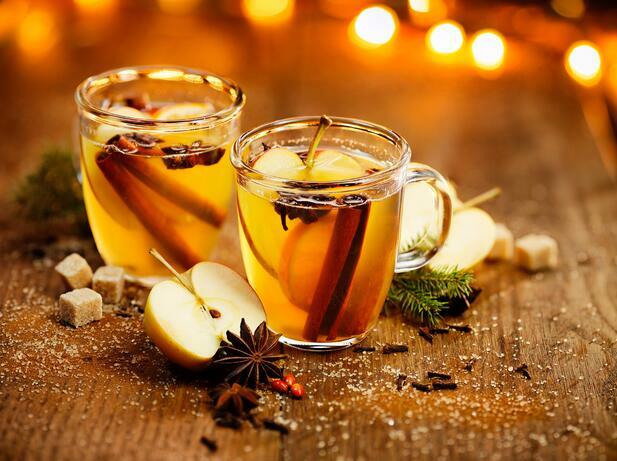 As soon as your guests walk in, they should of course be greeted with a drink; so how about some hot apple cider? This recipe is all done in the slow-cooker and only calls for three main ingredients: organic apple cider (or juice), apple brandy, and a sliced apple for garnish. Place cloves, allspice, cardamom and cinnamon sticks on a piece of cheesecloth and tie into a bundle with a piece of kitchen string. Pour your apple cider in the crockpot and cook on high for 2-hours, then reduce heat to low and finish off with the apple brandy and apple slices. This warm, delicious drink will surely be a fan-favorite on a cool Halloween night. Place cloves, allspice, cardamom and cinnamon sticks on a piece of cheesecloth and tie into a bundle with a piece of kitchen string. Combine apple cider (or juice) and the spice bundle in a 5-quart or larger slow cooker. Cover and cook on High until hot and aromatic, at least 2 hours. Reduce heat to low. Remove the spice bundle and stir in brandy. Garnish with apple slices and some of the spices, if desired. Serve warm. 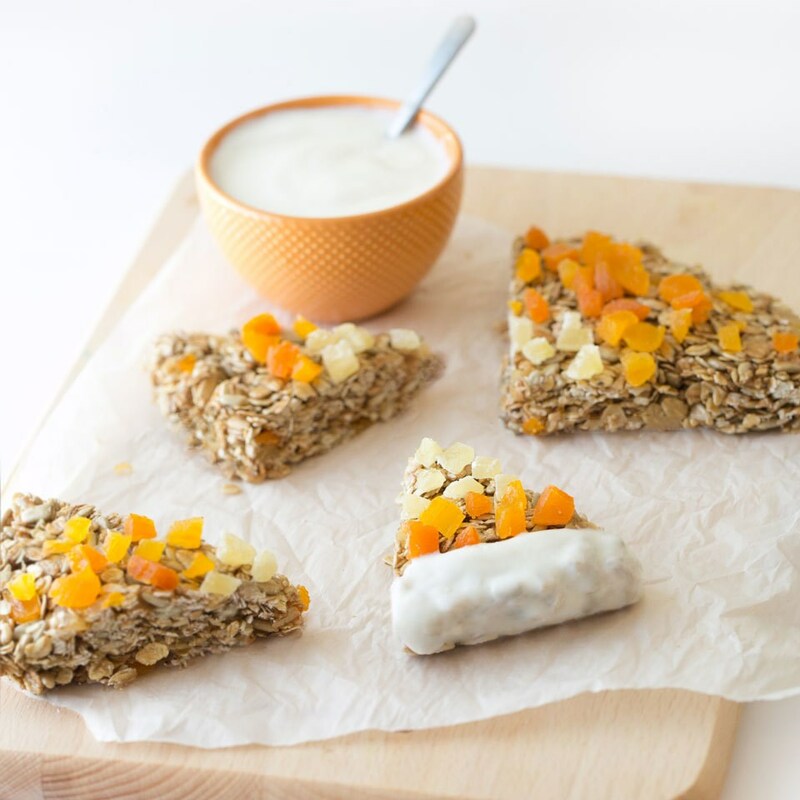 Now for picky hors d'oeuvres, these “candy corn” granola bars will surely satisfy everyone’s sweet tooth. These bars are a healthy alternative from the traditional candy corns we all grew up and loved, just without all the sugar! All you need is to mix some toasted oats and sunflower seeds with melted honey in a pan until they stick together. Then form into triangular wedges, to mimic the shape of a candy corn. Once you have your bars in the applicable structure, press dried pineapple and dried apricots pieces in the bottom and second third of the bars, respectively, to outline the same color coordination as a typical candy corn would. Lastly dip the edges in plain non- or full-fat Greek yogurt (your choice), and freeze until the yogurt hardens. Serve these immediately and enjoy satisfying your sweet tooth with healthy sources of carbohydrates and fat! Lastly, if you are in a crunch for time, and want your children to experience some wholesome snacks before they indulge in loads of candy on Halloween night, these three quick and easy bites will likely appeal to both their eyes and their stomachs! The first simple snack is peanut butter “candy” apples. Instead of dunking your apples in sugar-loaded caramel sauce, substitute that medium by dunking them in raw, salt- and sugar-free almond or peanut butter, for a healthier choice. The second of the goodies are clementine pumpkins; this stress-free preparation essentially consists of just peeling the clementine’s and placing a little piece of celery on the top to replicate the profile of a normal pumpkin. The third effortless snack is banana “ghosts”; merely peel the bananas, cut them in half, and place “O-shaped” chocolate bits on the bananas for the eyes and mouth. Your kids bellies will definitely be full and happy after eating these noshes! Happy Halloween! Spread oats and sunflower seeds on a rimmed baking sheet. Bake until fragrant, 5 to 8 minutes. Immediately pour the toasted oat mixture and salt into the honey; stir until completely coated. Quickly press the granola into the prepared pan using a heat-resistant spatula coated with cooking spray. Top the granola with a circle of pineapple pieces in the center of the pan and then create a ring of apricot pieces around it, stopping about 2 inches from the edge. Gently press the dried fruit into the granola. Let cool for 30 minutes. Cut into 8 wedges and transfer to a wire rack to cool completely. Line a baking sheet with parchment paper. Place the wedges on the pan and spoon 1 tablespoon yogurt onto the bottom third of each wedge. Place in the freezer until the yogurt hardens, about 15 minutes. Serve immediately. Check Out These Super Yummy Recipes!